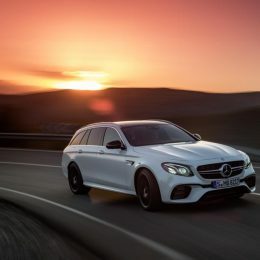 In the new E 63 4MATIC+* Estate and E 63 S 4MATIC+* Estate, Mercedes-AMG combines the brand’s hallmark Driving Performance with the intelligence of the E-Class. As in the Saloon, the 4.0-litre V8 biturbo engine with an output of up to 450 kW (612 hp) and the fully variable AMG Performance 4MATIC+ all-wheel drive deliver an outstanding driving experience. Acceleration from 0 to 62 mph in 3.5 seconds sets a new record in this class. At the same time the engine is now even more efficient thanks to a cylinder deactivation system fitted as standard. 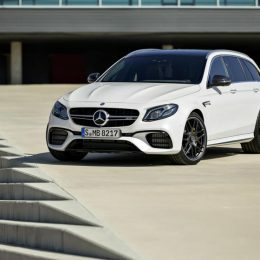 Like the Saloon, the E 63 4MATIC+ Estate and E 63 S 4MATIC+ Estate offer innovative driving technology and outstanding performance, coupled with a unique design and the latest infotainment systems. 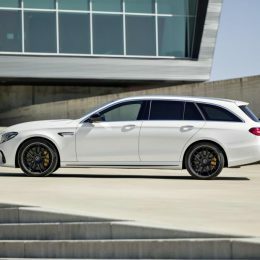 The new Estate boasts even more agile response than its predecessor: the AMG SPEEDSHIFT MCT (Multi Clutch Technology) 9-speed sports transmission is combined with a wet clutch. The new AMG Performance 4MATIC+ all-wheel-drive system combines the advantages of various drive configurations. Torque distribution on the front and rear axles, which is fully variable for the first time, ensures optimum traction in all road conditions. “The new AMG E 63 Estate combines our brand’s hallmark driving dynamics with high everyday practicality. It is not for nothing that the model has been a permanent fixture in the AMG portfolio for 40 years. 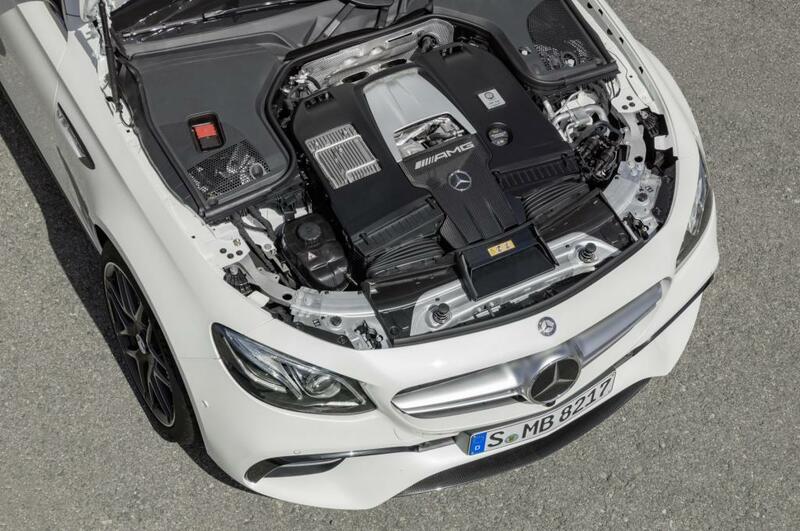 The powerful engine and the intelligent all-wheel drive underpin our claim to always be at the forefront of development when it comes to performance,” states Tobias Moers, CEO of Mercedes-AMG GmbH. *DIN kerb weight, not including driver; **EC kerb weight, including driver (75 kg); ***Electronically limited, 290 km/h with AMG Driver’s package. 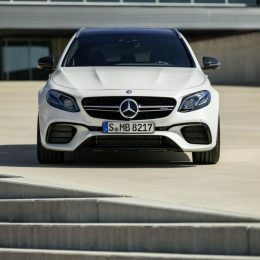 The distinctive, sporty design of the front end forward of the A-pillar demonstrates the lengths AMG goes to when it comes to development: for the first time on an AMG estate, the bonnet is inset between the wings and bumper like on a coupé, thus exhibiting an entirely new, more dynamic approach to the sculpting. More powerful-looking and 27 millimetres wider, the wheel arches accommodate the greater track width and the larger wheels on the front axle. A wide front apron inspired by the design of a jet wing, with flics in black and a large front splitter, epitomises the power of the new models. It also showcases the sophisticated cooling technology – a typical feature from motorsport and another visual reference to the powerful engine. 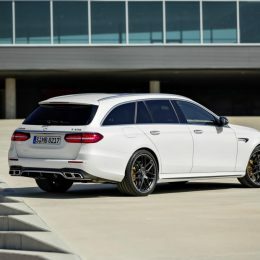 The side sill panels make the estate appear to sit lower on the road and elongate the overall line, with an apron insert sporting a diffuser and two high-gloss chrome-plated twin exhaust tailpipes. 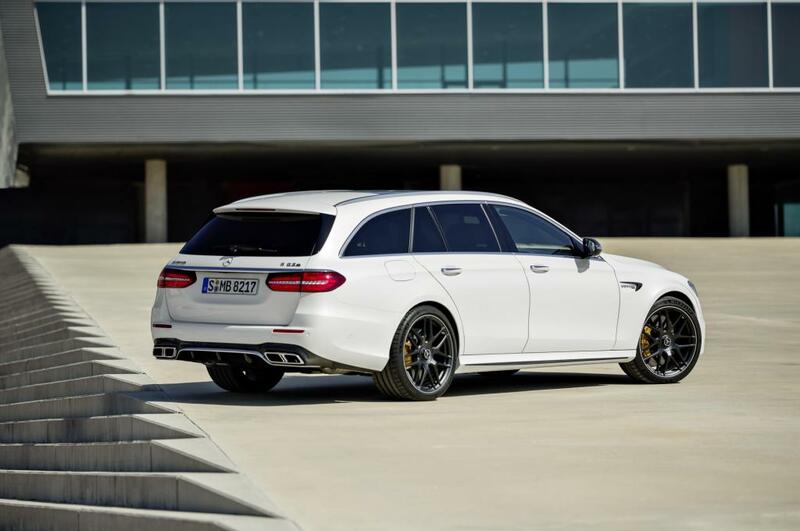 The hallmark AMG V8 sound has been tuned specifically for the Estate model. 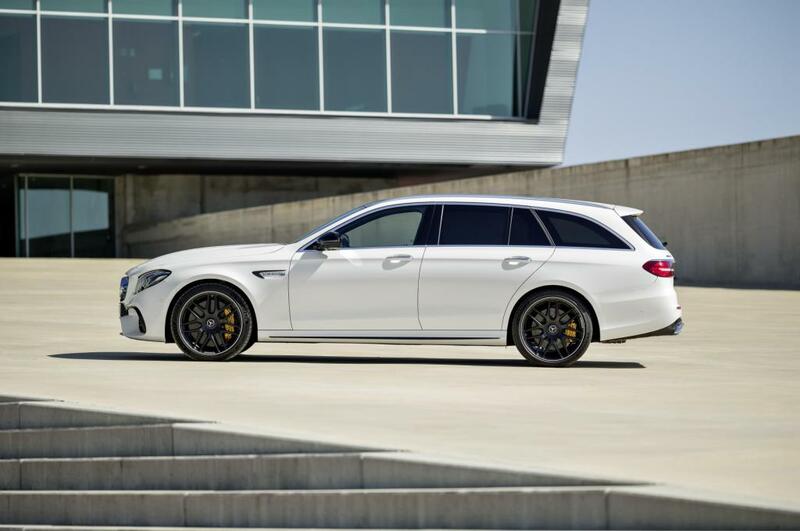 Designers and aerodynamics experts worked closely together to develop the E 63 4MATIC+ Estate. Their insights not only resulted in the striking AMG bodystyling but also the performance-oriented lift balance – for agile handling on country roads and optimum driving stability at high speed on the motorway. 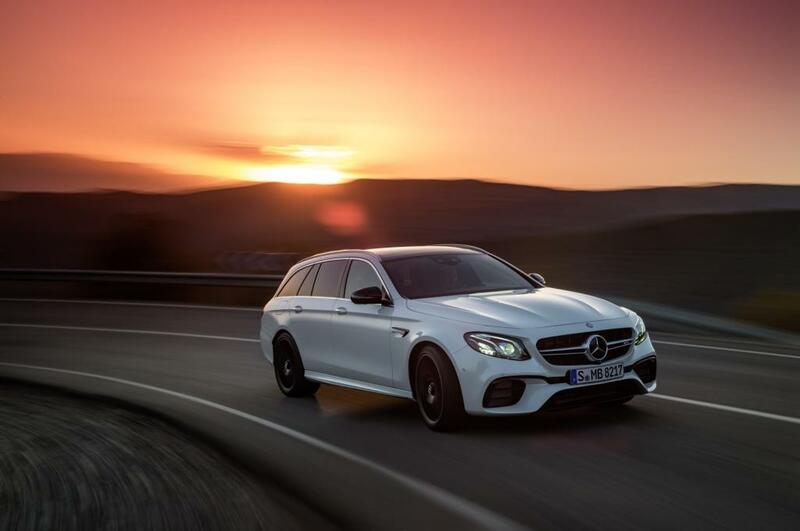 The new E 63 4MATIC+ Estate sets standards in its segment when it comes to everyday practicality: boasting a capacity of 640 to 1820 litres, its boot is the largest in the performance estate segment. The rear seat back comes as standard with a new cargo-related functionality: it can be positioned at a 10-degree steeper angle. This creates an additional 30 litres of cargo volume while continuing to enable full use to be made of five seats. In addition, the rear seat back can be folded down electronically in a 40:20:40 split. The versatile AMG 4.0-litre twin-turbo V8 engine in the E 63 S 4MATIC+ Estate takes peak output to a new level at 450 kW (612 hp). The maximum torque of 850 Nm is also a new high. It is available over a broad engine speed range of 2500 to 4500 rpm. 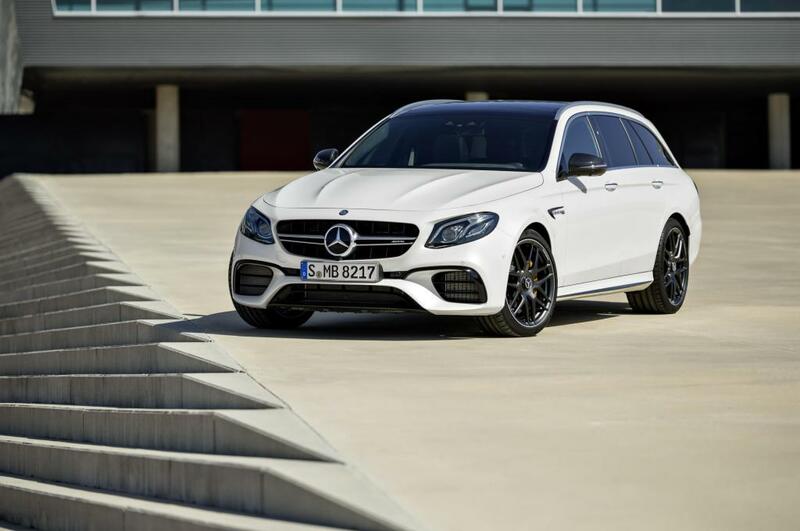 The E 63 4MATIC+ Estate is rated at 420 kW (571 hp) and has 750 Nm of torque. 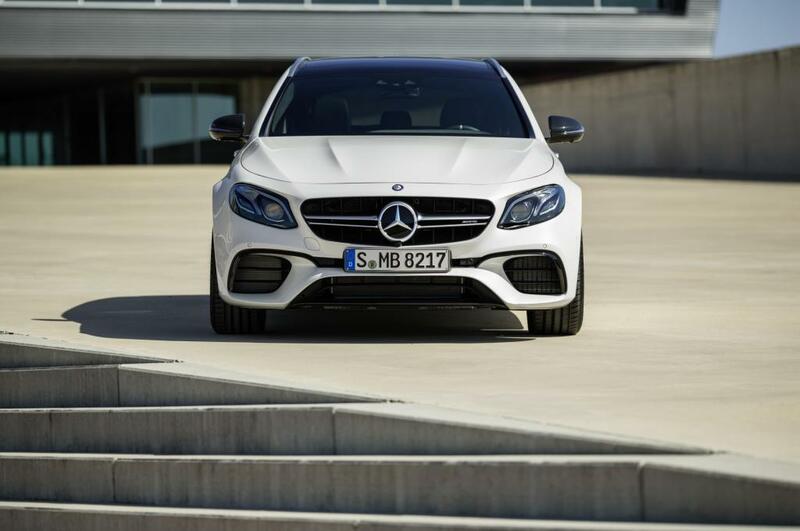 The S version completes the sprint from 0 to 62 mph in 3.5 seconds, the E 63 4MATIC+ in 3.6 seconds. 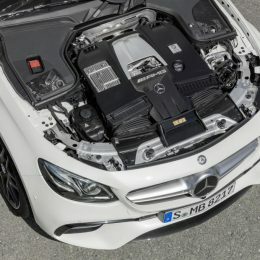 The standard-fit AMG Cylinder Management and a number of other measures make the new performance estate exceptionally efficient: with a combined fuel consumption of 31 mpg and CO2 emissions of 206 grams per kilometre (combined), both engine variants set a new best in comparison with their competitors. Twin-scroll turbochargers are installed for the first time to further enhance the performance and response of the AMG 4.0-litre V8 engine. They reduce the exhaust gas backpressure and optimise the gas cycle, resulting in higher output, exceptionally spontaneous response and higher torque at low revs. 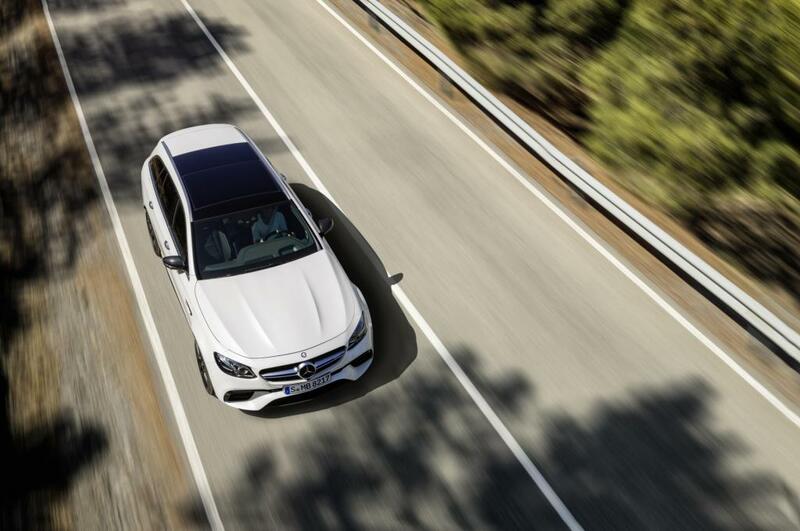 Both estate models come with the innovative AMG Performance 4MATIC+ all-wheel-drive system fitted as standard. This newly engineered, intelligent system brings together the advantages of various drive configurations: torque distribution on the front and rear axles, which is fully variable for the first time, ensures optimum traction on any surface. The AMG SPEEDSHIFT MCT 9-speed transmission is specially tuned to the requirements of both models, featuring re-engineered hardware and software. The software enables extremely short shift times and fast multiple downshifts while the double-clutching function makes for a sportier gearshift. A wet clutch replaces the torque converter. It saves weight and optimises response, especially when accelerating or coming off the power. The four different AMG DYNAMIC SELECT drive programmes “Comfort”, “Sport”, “Sport Plus” and “Individual” allow drivers to extensively influence the characteristics of the E 63 Estate. Key parameters are modified – such as the response of the engine, transmission, suspension, steering, ESP® and all-wheel-drive system. Independently of the drive programmes, the driver has the option of pressing the “M” button to switch directly to manual mode, in which gearshifts are performed exclusively using the shift paddles on the steering wheel. Individual suspension settings can be selected as required. The S version also comes with the “RACE” drive programme designed especially for driving on closed race circuits. Here all parameters are set for maximum performance. The agility and the high cornering speeds of the new models are down to the all-new AMG suspension with full-support multi-chamber air suspension, which ensures exceptionally high levels of camber stability, driving dynamics and steering precision. Thanks to a sporty spring and damper set-up and continuously variable damping, the new three-chamber air suspension system combines exemplary driving dynamics while keeping NVH levels to a minimum. The stiffness of the air springs can be adjusted by activating or deactivating individual air chambers, ultimately enhancing comfort and handling. There are three degrees of spring tuning, depending on the selected drive programme and current driving status. The spring rate is hardened automatically in the event of sudden load changes, fast cornering, heavy acceleration or heavy braking, which effectively reduces roll and pitching while stabilising the performance estate. The adaptive damping can be set in three stages – “Comfort, Sport and Sport Plus” – to choose between relaxed comfort on long journeys and maximum performance. The rebound and compression levels are adjusted independently of each other, and the freely programmable characteristics map permits a wide spread between the minimum and maximum damper force. The difference between the comfortable and sporty suspension setting is more refined and is clearly perceptible – depending on the driving style. The greatest benefit of the electronic rear-axle limited-slip differential is the even more sensitive and proactive control, which pushes the thresholds higher and makes it easier to drive at the vehicle’s limits. The three-stage ESP® with “ESP ON”, “ESP SPORT Handling Mode” and “ESP OFF” settings works in precise unison with the rear-axle limited-slip differential and the all-wheel drive, and is optimally tuned to the outstanding dynamics. 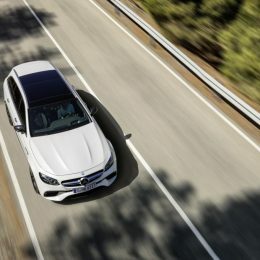 Unique in its segment, the E 63 S 4MATIC+ Estate is fitted with dynamic engine mounts, which solve the conflicting goals of achieving as soft a connection as possible to the powertrain for high comfort and as rigid a connection as possible for optimum driving dynamics. The dynamic mounts are quickly and variably able to adapt their stiffness to the driving conditions and requirements. These measures enhance the vehicle’s precision when driven dynamically, while the soft setting increases comfort tangibly. Both models feature electromechanical speed-sensitive sports steering with a variable ratio, which impresses thanks to the rack ratio with precise and authentic feedback. Steering power assistance is variably adjusted in the stages “Comfort”, “Sport” or “Sport Plus”. The relevant characteristics are automatically activated depending on the selected DYNAMIC SELECT drive program or can be personalised in “Individual” mode. The driver does not need to steer much at low speeds while at high speed he or she is able to rely on solid straight-line stability. The high-performance compound braking system is reliable, quick and fade-resistant, even under high loads. There are internally ventilated and perforated compound brake discs in size 360 x 36 mm at the front with six-piston fixed callipers and in size 360 x 24 mm with single-piston floating brake callipers on the rear axle. Inside, the AMG performance steering wheel in black nappa leather is ideal for a sporty driving style. The driver and front passenger enjoy a secure position in the front sports seats, whatever the driving style, thanks to the improved lateral support. AMG performance seats with integral head restraints can be ordered as an option. The interior of the S version has been further refined and includes a nappa leather trim for the dashboard and beltlines as well as seat belts in crystal grey and a steering wheel with grey 12-o’clock marking. All of the important information appears within the driver’s field of vision on the AMG instrument cluster. Dials in a carbon-fibre look and the distinctive typography lend the displays an especially sporty touch. The widescreen multifunction display with two monitors comes as standard in the S version, otherwise it is available as an option. 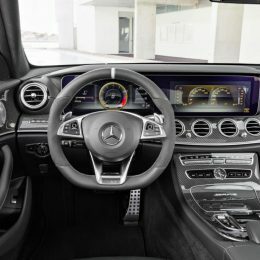 With the widescreen display, the driver can choose from three display designs unique to AMG: Classic, Sport and Progressive. From launch, the E 63 S 4MATIC+ Estate will be available as the exclusively configured “Edition 1” for around one year. The paintwork in designo selenite grey magno or optionally in designo night black magno and the AMG Night package further enhance the car’s powerful aura while the light grey stripes above the side sill panels emphasise the elongated side line. Added to this are the AMG 20-inch 7-twin-spoke forged wheels, painted in matt black with high-gloss polished rims. AMG performance seats in black nappa leather with yellow top stitching create a sporty feel in the cabin, which is further enhanced by the colour-coordinated yellow highlights on the AMG performance sports steering wheel, upper part of the dashboard, door panels, centre console, AMG floor mats and analogue clock in IWC design. The sports steering wheel in black DINAMICA microfibre features “Edition 1” lettering and a 12-o’clock marking in black. Carbon-fibre trim elements further enhance the exciting juxtaposition of colours and materials. The world premiere of the two performance estate models will be at the Geneva Motor Show in March 2017. UK sales release will be early April 2017, with first UK deliveries expected to arrive in August 2017. Exact UK specification is still to be confirmed.